Kekoa Roback was born and raised on the island of Maui. He graduated from Lahainaluna High School in 2004 and Honolulu Community College in 2006. Currently, he is a senior at the University of Hawai‘i at M?noa pursuing a degree in Mechanical Engineering, and plans to graduate in spring 2012. He enjoys the beach and hanging out with friends and family. Instruments and sensors used in oceanographic research require a source of energy in order to collect their data. This requires a portable, self-contained, sustainable power-generation system that can operate in the open ocean. Wave-generated power meets these needs, and when used in conjunction with photovoltaic cells, can provide an efficient means of sustainable energy. The Wave Energy Capture (WEC) device designed by Trex uses the repetitive vertical motion of a buoy on open-ocean waves to harvest power: the cable connecting the buoy to an anchoring device drives an internal rotary generator. The goal of this project is to design and test a sea anchor system for deep-water applications where a traditional anchor cannot be secured to the sea floor. Vertical alignment of the sea anchor and buoy needs to be maintained to maximize the energy harvested. 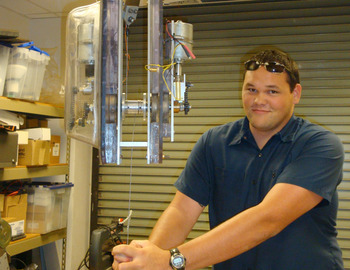 This will be accomplished using a sensor package to determine relative position, and a thruster assembly to reposition the sea anchor as necessary. I began the design using a commercially available sea drogue, originally intended for boats, which was in the shape of a conical frustum. Initial calculations, supported by in-water measurements, indicated that the size required for sufficient vertical drag would also result in excessive horizontal drag that would need to be overcome by the thruster system. Initial thruster designs were considered and a prototype built. Tests of the prototype showed that the power requirements for the thruster assembly would far exceed the amount of available power. Several alternate sea anchor designs were considered, drag calculations were performed, and scale models were built and tested. Pursuant to this analysis, an optimal design will be chosen and scaled up to provide the desired amount of drag for the second-generation WEC device. This design will be tested at the Kilo Nalu test facility on O‘ahu in late August, and the results will be used to refine the design of future sea anchors.